Mom life – it’s full of chaos from the very beginning. Changing what seems like a billion diapers over the course of a child’s existence, which of course multiplies if you have more than one child. Trying to keep a relatively clean home when all your hard work is being undone by a miniature human. Joining PTA, fundraisers for school, and heading up as assistant volleyball coach, just hoping that you’re getting at least one piece of the Mom puzzle right. Oh, and then you have to add a full time job to the mix? A severe lack of sleep from staying up late to soak in every little minute you have at home with your family. No time to actually take care of yourself and your health. No time for exercise. No time for meal-prep on the weekends. Extreme guilt every time you have to drop your kid off at day-care and you see those crocodile tears fall down their face as they are peeled away from you so you can get to work. As working moms, we’re often left feeling we’re doing it all wrong, possibly adding years and years of therapy to our childrens’ adult lives. Hell, sometimes even getting dinner on the table seems like a huge undertaking, even on the best of days! We know the importance of a homemade meal for our families. We know home-cooked food is healthier than picking up some grub at the drive-thru. We know that our families benefit from being together once a day at the dinner table. Yet, making it actually happen is way easier said than done, especially as a working mom. 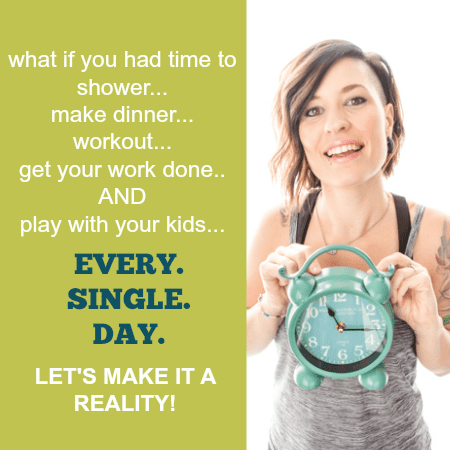 I’m going to show you how you can get a healthy meal on the table every single night, even if you’re a working mom and can’t even seem to get your thoughts straight. Even on nights when you’re sprung with a project that’s due the next day. Even on nights when you have to work late. Even on nights when you don’t think you can give any more than you’ve already given. In order to find some sort of order in your week, it’s important to create some sort of meal plan to go off of. I like to schedule my meal-planning time. Maybe you do it every Friday evening so you can go to the store first thing Saturday morning. Or maybe you plan the upcoming week’s meals on Sunday and pick up your groceries after work on Monday for the week. It doesn’t matter when you choose to meal plan. It only matters that you have a set time every week and stick to it. Here’s the question though. What meals are you planning? I like to keep a list of meals that I know my family likes and go to that list every week as I’m planning the menu. If you’re a Pinterst user, you can organize this all on your boards. I have a board full of recipes I want to try and pull from there sometimes. I add new recipes to this board all the time. Whether I’m waiting at karate practice, school pick-up, or I’m in the middle of a ridiculously boring meeting, recipes to try are always getting added. But once I know the recipe is winner, I move it over to a board labelled “Family Favorites” and choose from that board often. Also take into consideration what ingredients you already have on hand. Do you have produce that needs to be used up before it goes bad? Do you have 5 boxes of half-used pastas? Plan a meal around these items instead of buying all new ingredients. So now you know what recipes you’re going to make for the week. Write them on a calendar or menu planner. It’s time to decide what sides you’ll have with the main dish. I used to make the mistake of only planning for the main dish and forgetting all about the sides. Of course, keep it simple. A bag of steamable veggies. Apple slices. Whole wheat rolls from the bakery. Make it easy on yourself. Ok, meals are planned. You can now start making your grocery list. So as you’re making your grocery list, you’ll find that your shopping will be much easier if you divide your grocery list into the different sections of the store. Produce, dairy, frozen foods, meats, shelves, bulk items, non-food items, etc. This greatly reduces back-tracking and going all over the store trying to find that one item you missed while you were on that aisle. I can’t tell you how many times I would get home from the store, ready to make dinner, only to find that I didn’t pick up an item I needed that was on the list but I just missed it because everything was all jumbled and out of order. So frustrating and a time-waster. As you’re making the grocery list, ask your spouse and kids what things they may need for snacks, breakfast, drinks, lunches, etc. Often I would get so stuck in the dinner mindset, forgetting that we needed to eat the rest of the day too! I also like to keep a list of staples on the inside of my pantry door. Things like peanut butter, milk, butter, bread, coffee, etc. Things we need to keep in the house at all times. Once we’re out or close to out of that item, I’ll put a checkmark next to it so that I know to add it to my next grocery list. Now the list is made – let’s get to the store. You may have noticed that I said a weekly grocery store trip. Not nightly after work. Not every other night. Weekly. This will save you so much time, hassle, and even money if you stick to just one trip a week. This is something else that I like to schedule into my weekly routine. What time works best for you to spend 30-45 minutes at the store? Preferably this will be a time when you can go without your kids, getting you in and out of the store much quicker than if you being interrupted every 2 seconds from your 3 year old “needing” those fruit snacks. Last but not least of the grocery store tips. Check to see if any stores in your area offer online grocery ordering and pick-up. This has been a total game-changer for me and is becoming more and more popular all over the U.S. I still make a grocery list like normal, but then I sit down to my computer, order everything I need right from the comfort of my own house. No distractions. No impulse-buying. No need to leave my family. Then some amazing angel of a person gathers all my groceries, packages them all up nicely, and meets me at my car (that I don’t even have to get out of) when it’s my time to come pick them up. You know what? There are just some days when the cards just seem to be stacked against you. You could have dinner all planned out, all the ingredients are bought and ready to go, but when it comes down to it, sometimes life just happens. Maybe the boss held you up and you had to stay later to finish a project. Maybe there was a massive accident on the freeway that got you home an hour later than you expected. Or maybe you just have a killer headache and can’t fathom the idea of getting dinner on the table. Before you take your car to the closest drive-thru, let me tell you how I was still able to get dinner made on those nights when things just don’t go as planned. something that can be thrown together in just 5-10 minutes with very little prep or ingredients. something that can be pulled out of the freezer and popped in the oven (that isn’t an actual TV dinner you bought in the freezer aisle). So what are some examples of these meals in my house? Frozen lasagna or other casserole – next time you make a casserole, buy enough for two, and make one in a freezer-safe casserole for a back-up meal. These are meals that you can whip together super quickly if things go crazy. Or maybe your spouse can even make one of these back-up meals happen if you’re unable to. As you’re making your grocery list, make sure you have ingredients for at least one back-up meal that week. Kids love to help and there are actually some things you can have them do to help make your life a little easier. First thing’s first. Knowing what foods your kids like makes a huge difference in how smoothly dinner is going to go. If they see you making something for dinner that they just love, they are going to be excited for dinner and will be more apt to letting you get it done so you can get it on the table. I know from experience that if my son saw me making something he didn’t really care for, he had no drive for letting me stick to the task of getting dinner cooked and would interrupt me over and over during the process. Obviously, you can’t please your kids every time, but I’ve found the more that you try to appease their tastebuds, the more they’re willing to cooperate. Your kids can also help you to make dinner. What are tasks that are age-appropriate for them that would genuinely help you out? Your teenagers could cut all the veggies you need for the recipe. Your 5-10 year olds could get out all the ingredients you need so they’re all ready when you get home from work. 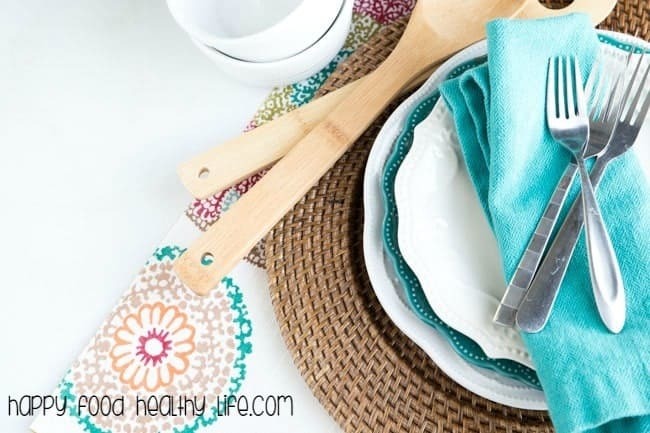 Your younger kids could wash the produce, put things away for you when you’re done with them, or help to set the table. There’s truly a job for everyone in the kitchen, and everyone should be able to help Mom out in some way as doing their part for the family dinner. Make sure everyone gets clean-up duties once dinner is finished too. There’s no reason why you should be in charge of planning dinner, making it all, and then cleaning everything up while everyone just gets to enjoy your yummy meals. There’s no way you should be expected to do it all. Working moms have it rough, because everyone expects you to be WonderWoman with some sort of super human strength to get every little thing done. The truth of the matter is that you can’t. You cannot do it all. At least not alone. It takes an army to raise kids, get dinner on the table every night, and keep your sanity, and now is the time to build your army. There is no way you can make dinner if your kids are interrupting you every second. Sure, they may need help with homework. Or maybe someone needs a diaper change. Or maybe they need help getting their little sister’s head unstuck from the banister. There will always be something. But if you were to stop to help everyone every single time, do you know how long dinner would take you? Probably 2 hours. No working mom has time for that, am I right? So who’s gonna be there for you 30 minutes a day every day so you can get dinner made and on the table? It’s time to talk to your spouse, your oldest child, or your neighbor because you deserve this time to focus on the task at hand. Your support person will be there to tend to all household needs while you make dinner. Your kids will know not to come to you unless they’re coming to help you with dinner. Talk to your spouse. Make sure they’re on board and are able to help you and your family out by giving you the time you need to make dinner happen. And you know what? Maybe this support person isn’t actually a person, but it’s a tv show. So be it. Whatever it takes to make dinner happen as quickly as possible with as little interruptions as possible. With these five steps, you have all the supermom skills you need to get dinner on the table every single night. Whether it’s a grilled cheese sandwich or a casserole you were able to throw together in less than 30 minutes, it’s always better than picking up fast food on the way home from work. Being a working mom doesn’t have to mean sacrificing yours and your family’s health. I know life is insane as a working mom, but these skills will help you start to get a grip on life and will help your evenings not feel so chaotic and out of control.